RadTreeView component provides styling mechanism for customizing the look of its items. To utilize it you would need to set ItemStyle property of the control to TreeViewItemStyle object. BackgroundColor (Color): sets the background of the item(s). BorderColor (Color): sets the color of the border. BorderWidth (double): defines the width of the borer. BorderLocation (Location): describes an enumeration describing where the border should be visible. TextCellTextColor (Color): defines the text color of the ListView TextCell. None - the border should not be visualized. Top - the border should be visualized only at the top side. Bottom - the border should be visualized only at the bottom side. Left - the border should be visualized only at the left side. Right - the border should be visualized only at the right side. All (default value) - the border should be visualized all around the item. 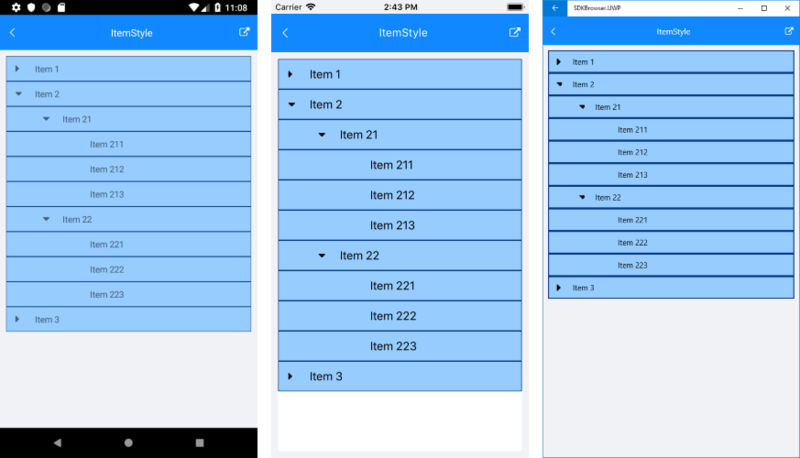 You can find a working demo labeled ItemStyle in the TreeView/Styling folder of the SDK Samples Browser application.